One of the biggest sources of device leaks come from benchmark databases, and GFXBench's online database has just spilled the beans on an upcoming ASUS device running NVIDIA Tegra 4. 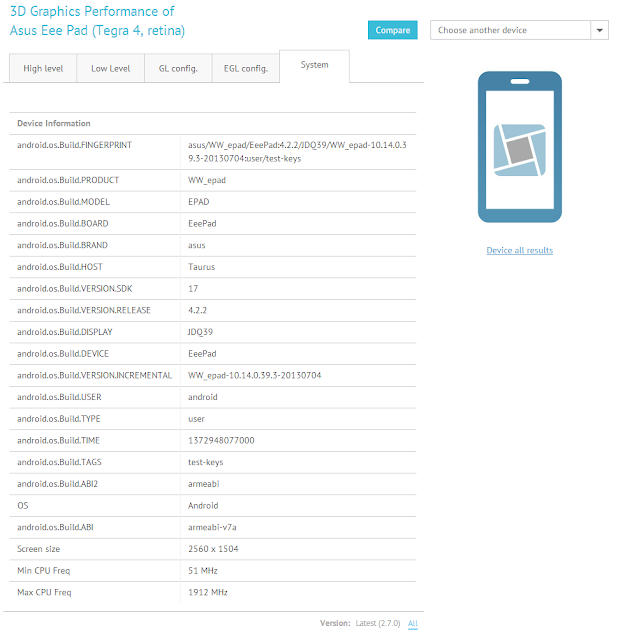 The unknown device's name only registers as "ASUS Eee Pad (Tegra 4, retina)". This is very odd, because the Eee Pad brand has vanished for over a year, as it was replaced by the Transformer Pad title. Now, I don't think a revival of the Eee Pad name is likely, so I assume we're dealing with a new Transformer Pad iteration here. The leaked results point to a Eee Pad device, running Android 4.2.2, running on a 1.9GHz Tegra 4 processor and with a 2560 x 1600 display. That falls in line with the official specs of the upcoming 2013 Transformer Pad Infinity. The software build numbers (WW_epad-10.14.0.39.3) are in accordance with ASUS' usual firmware build numbers, which gives these results more authenticity. The device's performance is pretty much in line with what the Tegra 4 has produced so far. Analyzing the very shader intensive T-Rex HD tests, You can see that, while the Tegra 4 can't quite outperform the iPad 4, it gets extremely close to it, to an extent that the difference in framerate is negligible (granted, the iPad 4 is 10 months old now, and it still has the lead). An impressive feat is that, on the Onscreen test, the Tegra 4 can keep itself very close to the iPad 4 despite the fact that it's pushing about 1 million pixels more. The performance hit for all these pixels should be much larger, so something about the Tegra 4's architecture helps it scale performance well as resolution increases. The Egypt HD test looks a bit worse for the Tegra 4. At normalized resolution, it can push a respectable 50 fps, but it's still about 5 fps behing the iPad 4, and in this test, the higher resolution seems to penalize the GPU more, as the gap increases to a 13 fps difference between the two. It can still push 30 fps though, which proves the Tegra 4 is capable of playing most mobile games at native resolution while keeping a fluent framerate. Fill test was always Apple's forte and at the same time NVIDIA's achilles' heel, and while fill rate isn't as horrendous as it was on the Tegra 3, thanks to Tegra 4's dual-channel (finally) DDR3 memory subsystem, it's still significantly behind the iPad 4, and even the Nexus 10. 1130 MTexels/s is a decent score, but falls begin the iPad 4's 2089 MTexels/s capability. This could be especially a problem at this extremely high resolution. While Tegra 4's memory bandwidth should be enough for most games, even with its resolution, a few games could suffer slight performance hits due to limited memory bandwidth, but I think that's only to occur later in the future. 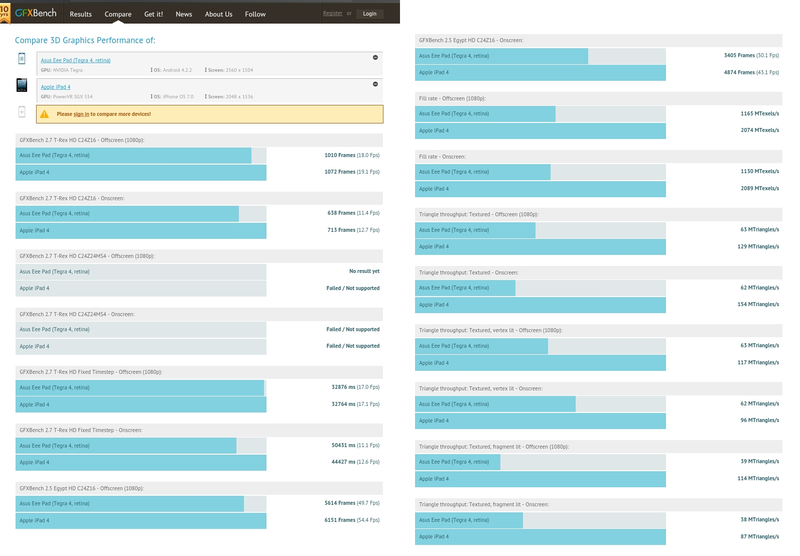 Triangle throughput isn't bad in the Tegra 4, as it can keep up with the Mali-T604 in the Nexus 10 and the Adreno 320, but, again, this is another speciality of PowerVR GPUs, as the iPad 4 and its PowerVR SGX 554MP4 trumps anything Android-based in terms of triangle throughput. But still, there shouldn't be any bottlenecks caused by triangle throughput in this device. I would take this information with a grain of salt, as there is no way of confirming the validity of these results. However, the fact that the results seem to fall in line with other Tegra 4 devices, and the specs reported are in accordance with ASUS' upcoming Transformer Pad Infinity tablet (more info here), and the firmware naming scheme seems pretty real, add up to make a big chance of this being a real device, probably the new Infinity. The 10-incher Android tablet is expected to launch in this quarter, so these results might indicate it will launch very soon.